Thank you for your interest in supporting Te Deum! Through your financial support, attendance at our events and ongoing encouragement, you make it possible to bring beauty into this imperfect world and positively impact the lives of others. 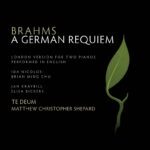 Thank you for supporting Te Deum! Please hit Donate below to make a secure, tax-deductible donation of any amount. Te Deum’s tax ID is 26-3397045. Donations can also be mailed (6641 Mission Rd, Prairie Village, KS 66208). We are excited to invite you to partner with our singers, musicians and volunteers as an 11th Season Sponsor. Your financial commitment to Te Deum allows us to continue bringing musically inspired, spiritually stirring music to the Kansas City community. Click HERE for more information about sponsorship opportunities, then hit the Donate button to process your commitment. We are thrilled to announce the release of our first recording!